Twenty-five (25) fun, colorful, and playful themes to set your portraits of children apart from anything any other photographer or Creative Artist is doing. Digital backgrounds and backdrops have photos of dinosaurs, puppies, fairies, lions and zebras, plus a wonderful selection of loving hearts to WOW your most discerning client. When combined with the magic power of the StudioMagic I & II Compositing Bundle plug-in for Adobe Photoshop users, you can mask and cut out your subject photographed in the safety and security of your studio; then, place them against one of the fun, colorful, and playful digital backdrops/backgrounds in Kiddy Pops Collection… done with a few clicks of your mouse. Each background is high-resolution image which is able to be cropped, or sized, to fit any custom print request. Since these are digital image files, the LayerCake Elements’ Hot Rod Backgrounds Collection is compatible with any editing application which uses layers to build the final photo. Tags: Adobe, art, children, Digital Backdrops, digital backgrounds, Digital Compositing, Fine Art, Fun, Graphic Design, Graphic Designers, Holidays, how to photoshop, Kiddie, Kiddy, Kids, Photoshop Users, Pop, portraits. 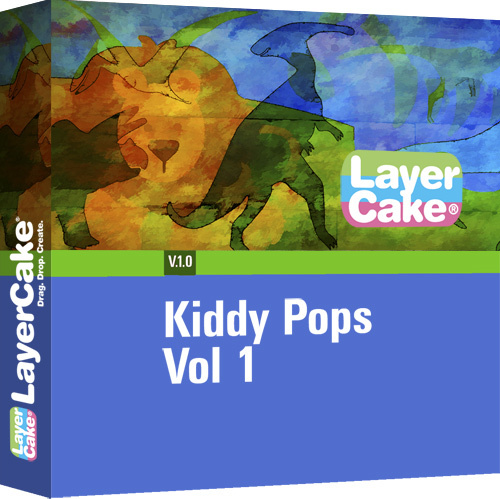 Kiddie Pop… goes the weasel. Well, almost. Preview all twenty five (25) backgrounds in the LayerCake Elements’ Kiddy Pop Background Collection by viewing the slideshow below.